Fall is settling in on us and that means it’s time for amending the soil for some plants to feed them into the new year and promote their next bloom. Start with poinsettias and roses then move on to the Christmas cactus and acid-loving plants. At the end of the month, check in on strawberry plants and get your leaf composter fired up. 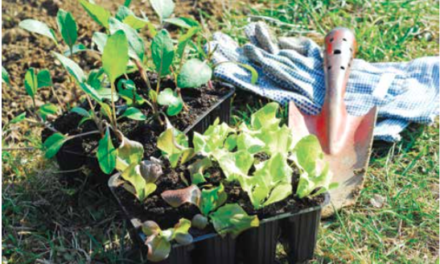 Fall is fun, but there’s still much to do in the garden. • Hosta plants are going dormant now. After foliage has yellowed and browned, cut stalks to the ground. Check the pH now and adjust, it needs to be between 6.0 and 7.0, to be on target for the new growth in the spring. • To get your poinsettia to re-bloom in time for the holidays, give it 12 hours of total darkness and 12 hours of light per day. Just a few minutes of artificial light will upset the process. Continue to do this for two full months. Also, fertilize the plants every other watering. My choice is Jack’s Classic Blossom Booster. • After the last roses bloom, spread bone meal over the soil and soak in. A lot of rose guides suggest pruning now; but I believe it is better to wait until March to prune back any rose. Do this before spraying dormant oil/lime sulfur spray. This will discourage any overwintering insects from taking up home near the garden. • Apply fall lawn fertilizer to prepare the lawn for winter. I recommend Milorganite because it fertilizes for root growth while providing nutrients for a thicker, greener lawn. It also extends your lawn’s rich green color into the winter, and prepares the lawn for the harsh winter elements. This is also a Chesapeake Bay friendly organic fertilizer! • Prepare your holiday cactus for Christmas flowering. Start exposing the plant to air temperatures below 60 degrees; an enclosed garage will work or just set outside in a protected area if air temperatures do not drop below 40 degrees. After chilling the cactus for at least three days, keep it in bright, indirect light, with room temperatures between 60 and 70 degrees to insure full bud development. • Apply Espoma’s Soil Acidifier to the soil around all acid loving plants, including azalea, holly, rhododendron, junipers, laurels, pines, spruce, and dogwoods. This product will acidify over time in the soil. • June-bearing strawberry plants start to manufacture flower buds for the fruit next season. Water weekly if no rain is forecast until Thanksgiving to achieve optimum bud production, which means more fruit next year! • Rake up all the leaves from your lawn weekly and compost by layering in the dry leaves, green weeds, chopped vegetables, or fruit peelings. If you do not have the space to start a compost pile simply use a heavy-duty black leaf bag, layer in the elements from above, and then poke holes all over the outside of the bag and wet the interior thoroughly, close the bag and set it in a warm out-of-the-way place. Shake the bag and turn it upside down to speed the process.